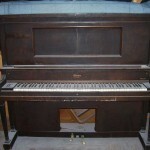 This player piano was made by Baldwin in the early 1900’s. The player was completely “gutted” as far as any player parts being present. Two hours away from our shop, we located the same piano complete with a marginally working player mechanism. While the piano itself was garbage (Hand painted red), the player system would work fine to be rebuilt and transfered over to the ellington. The pictures show this project in progress. 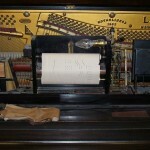 Like most, this player piano is no longer being manufactured. Parts are dificult to find (Especially the electronics) but at present are available from different individuals. The pictures show the aluminum stack (Which is the heart of the player) being rebuilt. in the diaphram action of the pouch. 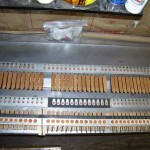 The pictures show the rebuild process as well as the bottom pedal resovoir restoration and removal of all the lead tubing with a complete re-tubing.